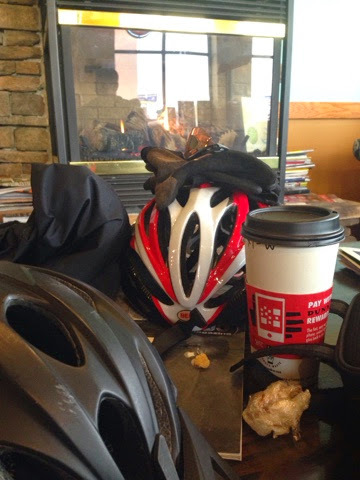 For the original Coffeeneuring idea visit the Chasing Mailboxes blog. 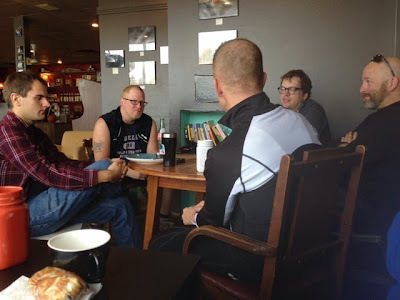 For my original Sioux Falls Coffeeneuring invite visit this post. The next Sioux Falls Coffeeneuring ride is tomorrow (10/13) at 9am from Coffea Downtown. 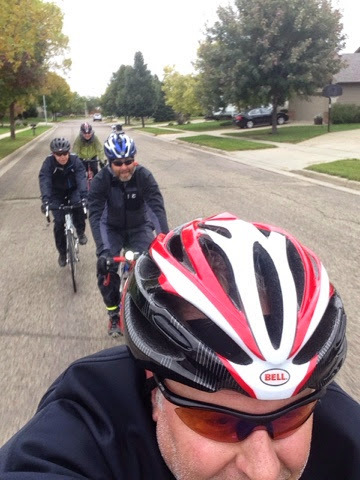 The second next Sioux Falls Coffeeneuring ride is November 1 at 9am from Josiah's. I wonder if it will be winter by then. This morning I pushed myself out of bed at 8am knowing that in 10 minutes rider Chris Parsley would be in my driveway for our 8:24 meet-up. Yes, that's right, Chris is as prompt a fellow as I am not. Sure enough at 8:26 I raised the garage door to find Chris on his 16th minute of waiting for me. I'm lucky he'll still ride with me. 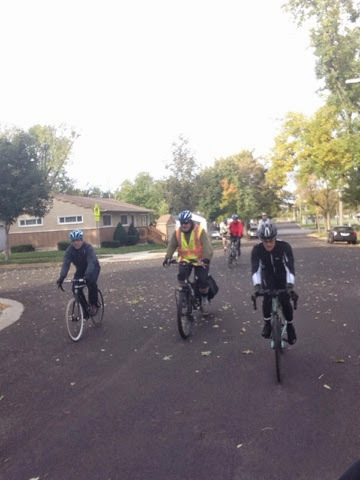 He and I do a lot of teaching that lane control is an important part of safe urban riding. In the spirit of practicing what we preach we'd already agreed that our Sunday morning route to the Black Sheep meet-spot would be on 12th Street from Sertoma to Grange. Good times. While enroute we did receive a honk, and the driver raised his coffee cup to us. A follow-up text revealed Pastor Dave, on his way to preaching in Emery, stopped off at Black Sheep in the spirit of Coffeeneuring. By the time our 9:01 departure arrived we'd gathered a Michael, Chris, Chad, Brian, Tim, Jake, Troy, David, Darren, a Big Dummy, and an Oxford Comma. While waiting we observed a riding dude play chicken with a driver on 12th Street, and a young woman riding side saddle over the rear wheel of a young man's bike. I wish I had a photo of the latter. They were on the sidewalk, facing traffic, oblivious to the danger and she was having lots of fun. The two highest lights of our loop included the on-street bicycling facilities around the shiny new events center and the length of the Main Avenue Road Diet. 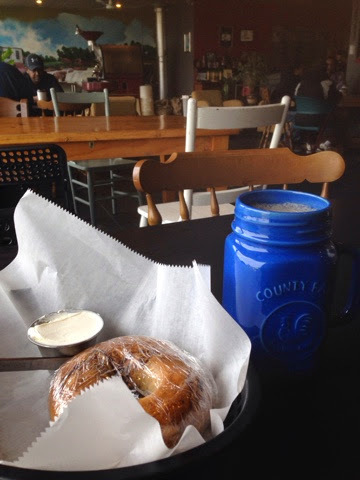 Upon returning to Black Sheep we gathered our brewed hot beverages, our muffins and bagels and sat and chatted for a while. Somewhere in there riders Jake (two Jakes!) 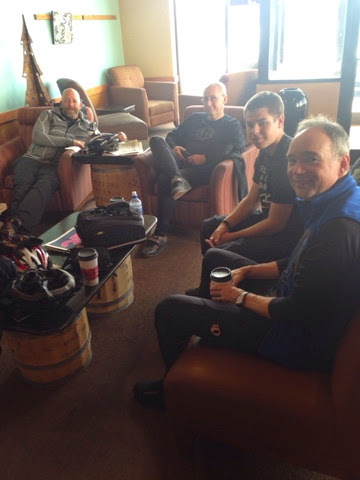 and Steve arrived on their own Coffeeneuring Adventure to join us. Then we all departed Black Sheep. My departure group was four, then three, then two, then three, then two, then me. See you tomorrow at Coffea - Downtown. First off - I needed to alter the schedule for the coming weekend. 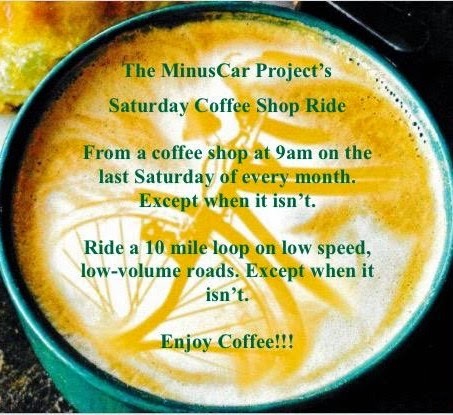 Monday October 13 at 9am we're riding from Coffea Downtown. Coffea Downtown is at the intersection of Phillips and 10th Street. From Coffea Downtown we'll head east to tour what I think of the two neighborhood bridges in Sioux Falls. The 12th & 18th Street bridges span I-229 and connect east Sioux Falls with the city core WITHOUT the need to access a brigde that handles 30,000 vehicles a day. These two bridges demonstrate how a city can remain connected to itself while still having the high speed interstate through it's center. Experience them and realize they are two of a kind built in an era with different values. We'll also leave downtown via my favorite way in and out of downtown, the Beadle Greenway. Throw in a visit to McKennan Park as well. The ride from Coffea Downtown is 9.8 miles. To make your Challenge more challenging I encourage riding to the ride. This morning I awoke motivated by the possibility of leading Sioux Falls' first Coffeeneuring ride. The Boy 16 accompanied me as we departed at 8am ready for the hour long ride-to-the-ride. We shaved minutes by enjoying the lightish Sunday morning traffic for a bit on west 12th Street and later the moderate Sunday traffic for a stretch on east 6th Street. Back in the parking lot two trusty urban riders had gathered - relieving me of the always nagging question, "what happens if you throw a party and nobody comes?" We headed south around the Dawley Farms strip mall. Further south we went on the SD 100 sidepath. We're not thrilled about the sidepath experience but I think it's important to ride built facilities on occasion to remember why they don't always work. Besides, you have to ride this path to experience the long pedestrian tunnel under SD100 into Harmodon Park. This spot is where I first heard the comment, I've never seen that before. My favorite thing about route selection. Taking people places in the city they've not been. We played in the streets parallel to Sycamore for awhile and ultimately arrived at Rosa Parks Elementary. There is a nice asphalt path through a cornfield connecting the school to a neighborhood. The obvious question is, why didn't they do this for McGovern Middle School? I don't know the answer, but I do know this school has one. From here we went mostly straight back to the meet spot with a short bit on Arrowhead Parkway. At Dunn Brothers Coffee we sat around the fireplace and enjoyed warm beverages and roaming conversation. We also discovered our fifth participant. He'd arrived late and missed the loop portion of the day. We were happy he waited for us at the shop - and his long ride there qualified him as a Coffeeneur. We departed as a group for the ride-from-the-ride and dudes peeled off along the way eventually leaving me and The Boy 16 on our own. The wind was picking up by the time we got home. As I type this I'm happy to be home not riding in it. To ride the loop meet at 9. Give a notification anytime before 9 and we'll wait for you. (note: I changed the date to October 12.) The third ride of the Coffeeneuring Challenge is coming up. Ride #2 departs at 9am Sunday morning October 12 from Black Sheep Coffee. Black Sheep Coffee is near the intersection of Grange Ave and 12th Street. From Black Sheep Coffee we'll go south and west, then north and west, then north, then east, then south, then west and then, and finally, north. Got it? The sights we'll see will not be limted to: a neighborly way to the Premier Center, the painted bicycles on Russell and West Aves, and the full experience of The Main Avenue Road Diet. The ride from Black Sheep is 9.8 miles. To make your Challenge more challenging I encourage riding to the ride.